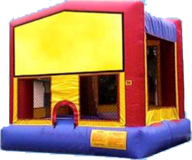 Bounce House Rentals...The Party Starts Here! They are known by many names: bounce house, moonwalks, jumpers, bouncers or even a kids party inflatable thing. We call them a great time and we have a great selection with all of your favorite characters. We also have inflatable slides, water slides, chairs and tables, and concessions including: popcorn machines, sno-kones and cotton candy. So whatever you want to call them...give us a call or reserve on-line and we promise a great time.